The Hoyo de Monterrey Hoyo Du Prince is a sweet and mild Corona, 5.1” (130mm) long, of 40 ring gauge, and comes in a 25 cigars box. The Le Hoyo Series was created apart from the Hoyo de Monterrey line, this explains the difference in names and shapes of the cigars. The Le Hoyo cigars are thinner and they are slightly stronger than the regular Hoyo de Monterrey. The Hoyo du Prince hovers around a mild to medium, which main aromas are of wood, earth and leather. There is a lot of sweetness in the aromas, lots of creaminess, some honey, some nuts, and some fruit notes also add to the richness. The spices are also always present, but never too strongly, just a tingle on the lips. Overall a mild and rich cigar, perfect for a morning cigar. Pretty affordable. A cigar that ages very well, 2 years of ageing are recommended. 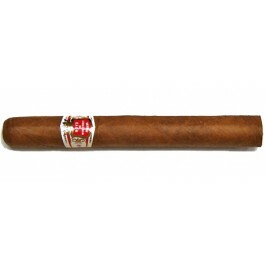 The Hoyo Du Prince is a very good option for a mild cigar that is also rich and genuinely Cuban. • Complex cigar, with creamy coffee flavors, lots of wood, earth, leather in addition to the dominant tobacco flavor. • Ages very well. 3 years on, the cigar becomes even more complex and creamier. This cigar simply delivers a nice Cuban experience at a lower cost. The Hoyo du Prince is unique in its shape among other Habanos, it is pretty heavy in hand and is good looking. It is nicely rolled, with a beautiful triple cap. The wrapper is light brown; it looks silky and slightly oily. There are only few small veins visible on the cigar. It is tightly and evenly packed, pretty firm between the fingers. There are sweet and woody aromas coming out from the wrapper, with some floral hints. Once cut, the draw is a bit on the tight side, but doesn't hamper the quality of the smoke. The cold draw reveals the expected flavors of wood, tobacco, earth. There is also some sweetness of honey, sweet butter and a hint of mint. Once lit, there are rich, thick billows of smoke filling the air. The burn line is great right from the start. Perfect construction. The first third of the cigar is predominantly marked by woody aromas, dark and earthy tones. There is also plenty of sweet tobacco, leather and a bit of spices, black pepper, cloves, but not too spicy. Some nice nutty aromas also appear, mostly on the retrohale, some fruits notes, herbs and vanilla flavors. This richness and complexity of flavors are very creamy and smooth, almost chewy. The mix of flavors works beautifully, it is decadent. And the thick smoke that goes along adds to the amazing experience. In the middle third, the flavors get deeper and are well balanced between each other, the dominant flavor are earthy and woody, there is also more leather. It is a beautiful mix thanks to rich under tones of nuts, sweet raisins and spices notes. There is still lot of creaminess, but some deep aromas at the same time, but never overpowering. The cigar is still pretty mild. In the final third, the spices notes increase in power, both on the lips and on the tongue, while the earthy tone persists. The cigar's strength is now closer to a medium body. Alongside the creamy profile, there is also some mocha coffee, dark chocolate and some fruity notes (cherries). It is still very sweet overall (brown sugar), with rich aromas of Cuban tobacco. There are just few hints of grass, of flowers, and of bitterness. A beautiful end to the cigar. In summary, a great morning cigar, very rich and mild.